In the span of 3 hours, I witnessed 9 arrests by NYPD, made some new friends in solidarity, nearly lost my voice, and oscillated between deep elation over a people united, and inexplicable anger at the irony of continued police injustice during the very march to abolish it. 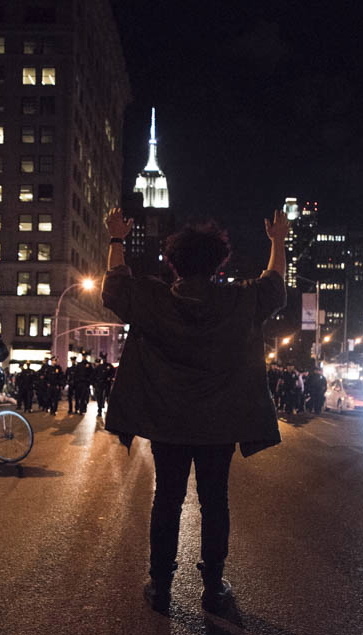 This was the Million March NYC in response to the Baltimore uprising and the death of Freddie Gray. The beginning of Million March NYC on April 29th. Within five minutes of our march, we were stopped by police blocking the road ordering us to return. Peaceful protestors initially turned around to march back until some inevitably began to push and shove while dodging aggressive police. Forced on the sidewalks, we watched on. One policeman hoisted a loud speaker projecting robotic messages to disperse the crowds and “maintain order.” This degree of militarized policing was rare even for seasoned protesters. For a moment, it felt as though we were transplanted to an unfamiliar warring state. In the next ten minutes, the police exerted power and control by making at least 6 unnecessary arrests of peaceful protesters who may have been unlucky to stand and chant near the cops. We chanted even louder, “Shame! Shame! Shame!” Watch the video here. Fragmented, protesters gathered in smaller groups and marched on with our message: New York is Baltimore, and Baltimore is New York. A marching band joined with musical accompaniment that made the heavy chants and solemn mood a bit lighter. We chanted on, “This is what community looks like! This is what love looks like!” Intermittent celebrations of our collective solidarity served as a good reminder to take a look around and appreciate the power of organizing. 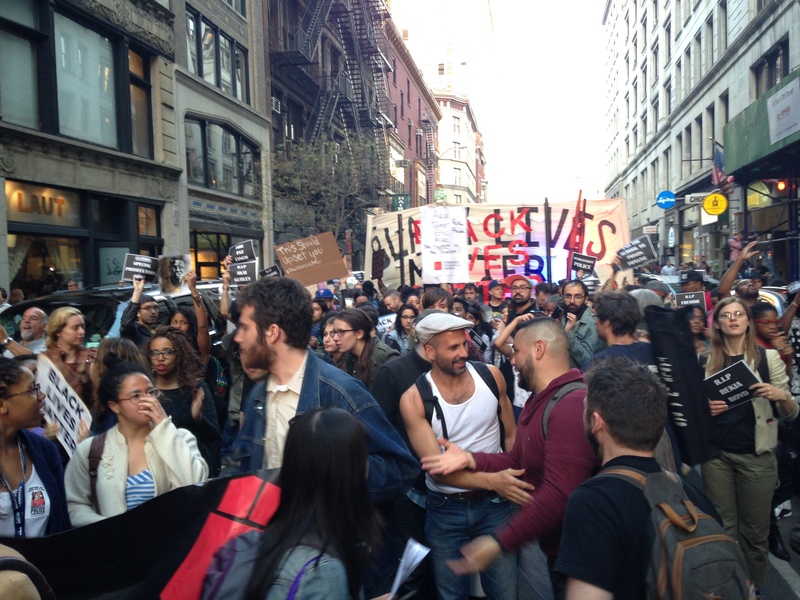 In spite of police intimidation, we spilled into the streets as a form of disruption. Civil disruption and its intended inconvenience mean that we are capturing attention, even if momentarily. It is a short sliver of time for the otherwise voiceless individuals to claim a few moments to be heard: “Black lives matter!” Stopped cars waited patiently while protesters encouraged drivers to get out and join. For every annoyed, head-shaking driver idling on the road, just as many smiled in delight, enthusiastically honked their horn, and chanted along in support. We took over Broadway from Union Square to City Hall, and back to Times Square. A protester stood with his hands up as police charged forward. In their most subdued state, police guarded behind us or next to us to keep watch. On several occasions, the police not only stood assembled, blocking the way, but charged towards us to get us out of the streets and onto the sidewalks. If you were the unlucky few who got caught on the street chanting, you may have been arrested. During one of the altercations, the leading “Black Lives Matter” banner was torn off its posts while an excess of nearly 9 policemen charged to arrest one man. 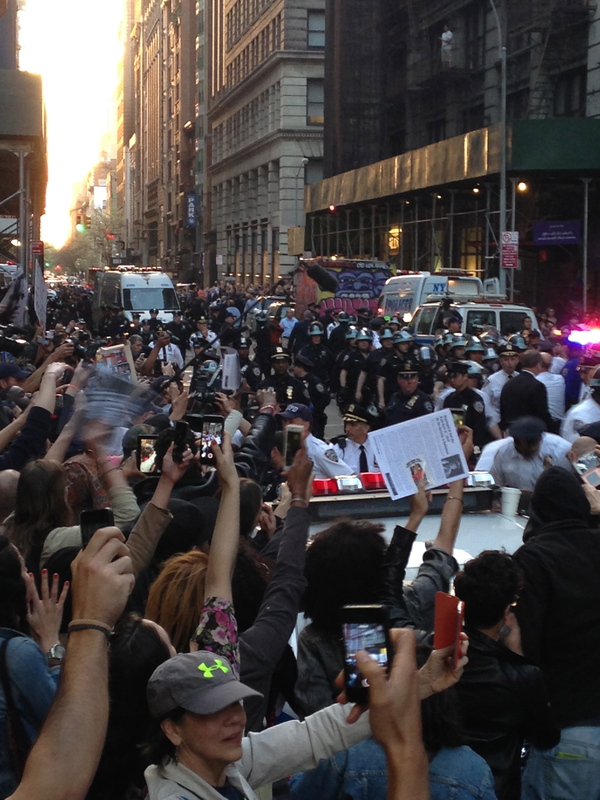 I couldn’t take my eyes off the giant mound of cops excessively piled over a single protester faced down. Others plead with black policemen and women, urging for understanding and solidarity in place of aggression and authority. In response, most turned away with no words, exposing their conflicted positions. The more the police tried to control, the more we marched on. The now bare banner posts marched on, too.